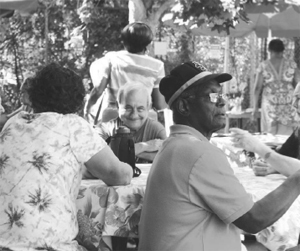 Friendship Circle, one of four senior centers operated by Senior Community Services (SCS) is a community-based organization. SCS has four national accredited senior centers, and an abundance of programs directly serving the aging population in the service area of Delaware County. SCS’ goal is to continually develop and improve upon a comprehensive, coordinated and accessible system of services responsive to the needs of the aging population within the community. Last year, SCS’ programming touched more than 16,000 lives in Delaware County. Friendship Circle (which is on the campus of Fitzgerald Mercy Hospital in St. Bernard’s Hall) is open Monday through Friday from 8:30 am until 4:00 pm where active, older adults can take advantage of exercise classes including Zumba and strength training, educational programs (including computer classes, monthly book clubs, interactive/internet presentations) and a delicious lunch while socializing with peers in a comfortable, welcoming environment. Friendship also sponsors trips (extended, one day and casino). Last year, 11 members traveled with Senior Excursions on a 4 day trip to Niagara Falls, and 50 members traveled to Lahaska, for an evening excursion on the Ivyland Dinner train. Last holiday season we took a trip to Longwood Gardens to see the Holiday Lights, and also to Hershey Park to take the Holiday Lights tour. On July 13th we will be going to Ace in the Hole Dinner Theatre to enjoy a Tribute to the Drifters. And September 15th we will take a ride on the Spirit of Baltimore Luncheon Cruise. You are invited to come in and take a tour, meet our members and enjoy a complimentary lunch. We are also open on Saturday mornings with different exercise classes geared towards seniors. For more information on the center and its programs or to register for any of our special events, please contact Donna Schumacher (Program Coordinator) at 484-534-2033.